Everyone at Carpe Vino—from owners to service staff—was born into a modest family, and there are just two Francophiles in the joint—Courtney and Eric. We’re basically a blue-collar group with the aim of keeping our approach to fine dining and wine service simple and elegant. We’ve set a high bar for ourselves on every measure of quality, and while we’ve had some success early in our growth as a restaurant, this is not a pretentious nor arrogant establishment. Our goal is to be the best we can, making certain our guests are comfortable when they visit and sated when they depart. 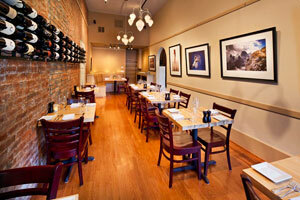 Our hope is our customers appreciate and savor the place, cuisine, wine, people and service that comprise Carpe Vino. This ain’t no strip mall restaurant, and we’ve tried to maintain the look and feel of this historic building, right down to the bar—the original having been purchased by movie actress Mary Pickford in 1931. At the same time, we’ve sought to create an intimate, adult space where our guests can relax in comfort to enjoy fine wine and fine dining in a venue seating just 32. To enhance the experience, guests must be 21 to dine with us. The walls of Carpe Vino are lined with more than 500 labels, leading one guest to comment that he felt like he was being hugged by the wine. The walls are adorned with the art and photography of both nationally known and local artists, and it is all available for purchase. It’s the kind of place that makes you just feel good and at home. 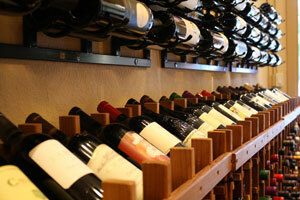 At Carpe Vino, our roots are in retail wine sales and that continues to be our primary business. But these days, it’s all about the food. We opened our restaurant in April 2006, and this act changed everything. 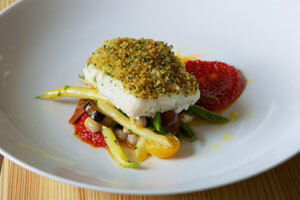 It’s difficult to classify precisely our brand of cuisine because it is so eclectic. Our chefs, Courtney and Eric, describe it as “refined New American using French techniques influenced by flavors from around the world.” They are loathe to pigeon hole Carpe Vino as French or Mediterranean because they want to be free to employ unique flavors where ever they find them. So, at any give time, our seasonally and frequently changing menu might feature Moroccan-spiced lamb tenderloins or scallop ceviche, ahi tuna tartare or a classic American dish such as fried green tomatoes. One thing that really distinguishes Carpe Vino’s food is we get the best and freshest core items, from meat to fish to vegetables and fruit. And that means buying PlacerGrown. We walk the talk, because you’ll see Courtney and Eric virtually every Saturday morning hand-selecting the raw materials for our dinner service. They walk down to the Farmer’s Market and haul back the goodies with a hand truck. In Courtney’s own words: “At Carpe Vino, we have developed relationships with local farmers in Placer County—something we feel is very important and something of which we are very proud—including Blossom Hill Farm, Pine Hill Orchard and Edwards Family Farm, to name a few. Our wine service is notable for two reasons. You’re surrounded by the stuff, and we encourage our guests to browse the racks and make their own selections. With more than 500 different labels from which to choose—with many hard-to-find and limited-production vintages—there is something to please every palate in any price range. Any bottle opened at the table is priced at our everyday retail charge, plus $5, representing a significant value over typical restaurant wine markups. At any given moment, Carpe Vino also offers 40+ wines by the glass, and we provide a menu of these offerings (which change frequently), all of which are connected to an argon gas system to protect open bottles from the ravages of contact with oxygen. We offer both three- and six-ounce pours, and customers are welcome to choose from house flights, or you can design your own. Our staff is, of course, very knowledgeable about wine, and we’re delighted to make recommendations. First and foremost, Carpe Vino is a one-off, a singular place. It is family-owned and you’ll find one of us in the joint just about every night, keeping an eye glued to the ball. We take an immense amount of pride in our business, and we know our reputation is on the line every night. We take nothing for granted, and neither does our talented staff of professionals. Drew runs the show, and at just 26 he handles himself like the seasoned pro he really is. He’s worked the joint since we opened the doors and he has learned his lessons well. Don’t try to stump the band with this kid—he knows his stuff. He is a personable host, but a relentless task master. And oh yeah, just about everyone loves him. Our chefs, Courtney and Eric, are fanatics. Nothing leaves the kitchen unless it is perfect, and they have total oversight over the dining room as well. They have free reign; it’s their bat and ball and they run the show. They have the training—both are CIA Hyde Park grads—and the experience having worked in restaurants around the country. In the front, our staff owns equally impressive credentials. Every server has a deep restaurant and/or wine background. These people know from good service and they deliver every night. 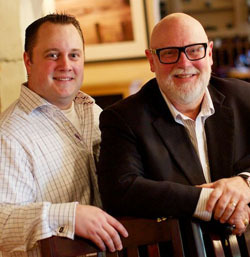 At Carpe Vino, the service is gracious, congenial and omnipresent. Our staff is friendly to a fault, but we don’t seek to become part of your party. . .we’re adjacent to it. Our mission is to make sure your evening runs smoothly and your orders are placed efficiently to make certain the service flows. This is fine dining, though, so a typical service takes upwards of two hours for four courses. Your table is yours for as long as you care to stay, and it’s not uncommon for our guests to consume as much as three hours for dinner. Beyond what you would expect at your table—linens, elegant tableware and place settings—we also use Reidel stemware for all beverage service. We stock seven different glasses, so if you order pinot noir, it is served in the proper vessel. In the early days of Carpe Vino, we knew most of our customers by name. That’s tougher to do now because we have many new faces every night in the dining room. But come a couple of times, and we’ll greet you by name.